Noelle is sleeping so I thought I would take a moment to blog. I'm not sure the direction this blog is going to go...but I will get my fingers moving and see where they take me! I can't believe that tomorrow, Noelle will be 3 weeks old. Where have the last 3 weeks gone? I can tell you. I have been holding her, feeding her, changing her, sleeping with her, and staring at her. I have snapped about 600 pictures, planned her wedding in my head, and envisioned her as a toddler with bouncing pig tails, following me around all day. It goes without saying that Noelle has changed me. Being in the presence of someone who is truly innocent and has not yet been tainted by the world is such a humbling experience...similar to what I would think being in the presence of Jesus would be like. She's perfect in every way. I want to be better for her. She inspires me so much to really be the person I know I should be. I want her to be proud of me and of Luke. I want her to know how much we love her and will sacrifice for her. I want her to know how hard it is for me to be brave and stay all night with her while Luke is working at the hospital, but I do it because I know that I am not a child anymore...and I must be the adult for her. Noelle will change the way I teach my students. When I look at her face, I see my students, and I have a feeling that when I look at my students, I will see Noelle. I will see them as the true children they are. I will respect the fact that they were once Noelle's size, and they deserve to be treated with kindness (not that I don't, but I can easily forget that they are KIDS). I can now forever say that I will treat my students the way I would want Noelle's teachers to treat her. Having a child truly gives you a new perspective. Well, I have given myself 3 weeks, and now it is time to get back to some normalcy around here. Our housework is building up, and I can't use the excuse, "I just had a baby" for much longer. We need to learn how to put Noelle in our routines and not use her as an excuse to do nothing. Along those same lines is the fact that I lost a quick 20-22 lbs. after she was born, but I have a good 10-15 to go before I am back to what I looked like before I got pregnant. I need to start thinking about myself and getting myself back to the shape I was in...not only for looks but also for my health. I want to be here Noelle as long as I can, and eating crap and not exercising will not help. Here's to a great future with some positive changes! Thank you, Noelle. Hi! 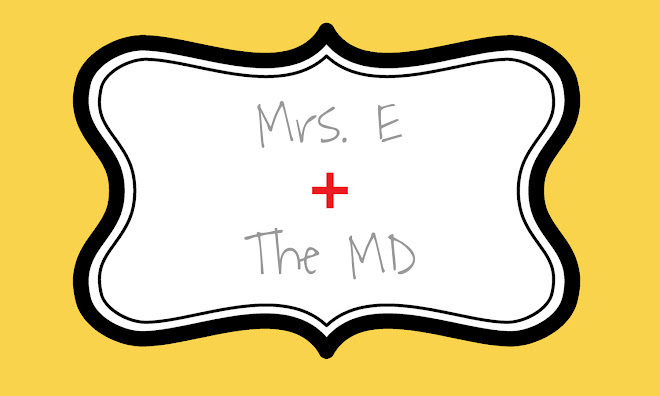 I'm Ashley E, better known as Mrs. E to my 4th grade students. I am married to a family medicine resident, and we are parents to a beautiful toddler, Noelle. We are excited to welcome our second child into our family in October! Along with being an elementary teacher, I am also a professional photographer of children and families. What started as a hobby has turned into a busy business that fills most of my weekends throughout the year. I have a real interest in blogging. I love reading blogs and adding to my own blogs. I enjoy expressing myself through writing, and I love gathering new ideas by reading the words of others. I hope you enjoy your time here and come back often!